Rose Rafferty or Budgierose as she is known as in Australia comes from the Netherlands. 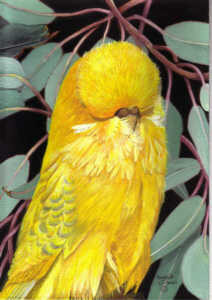 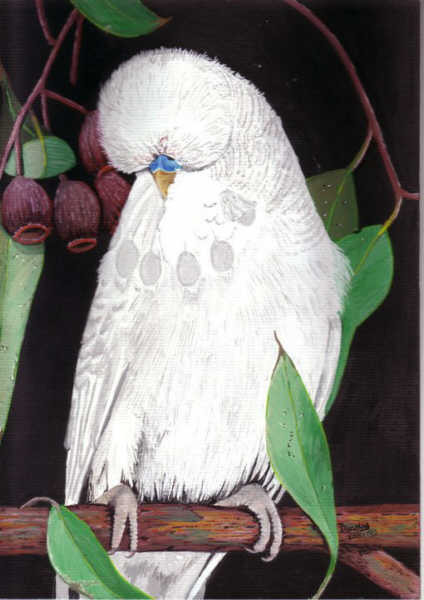 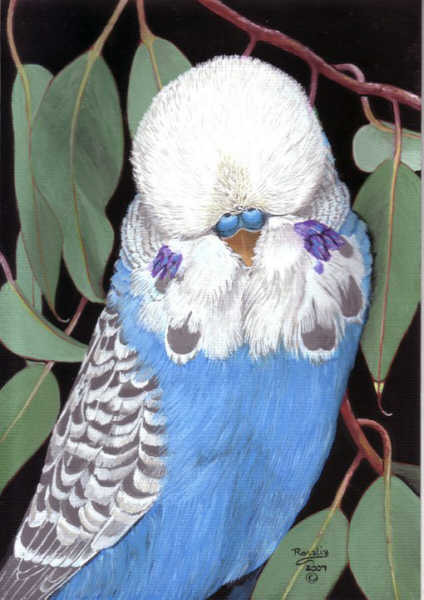 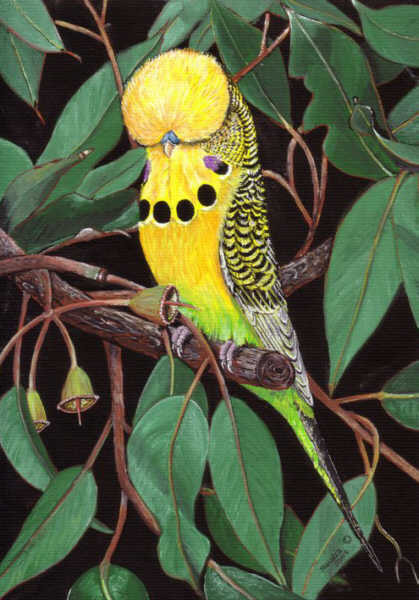 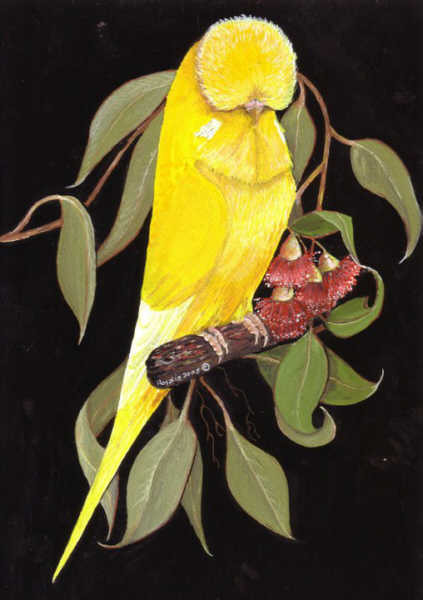 She has lived in Australia for many years and has been breeding Exhibition Budgerigars and painting them since 2000. 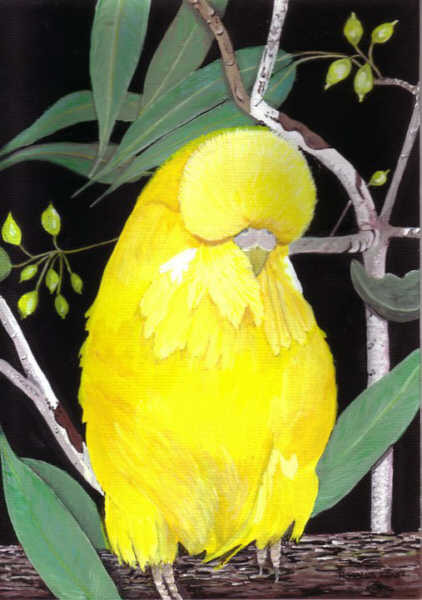 Here we feature a selection of Rose’s superb paintings. 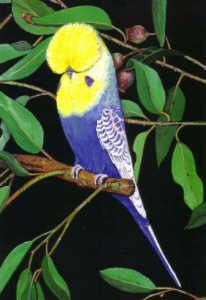 Rose and Mike Rafferty are both migrants to Australia. 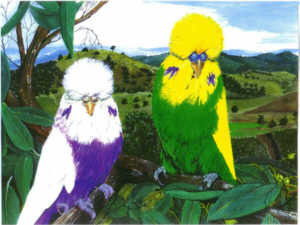 Rose comes from the Netherlands and Mike hails from Scotland and they have lived in Australia for close on 40 years. Mike has been breeding exhibition budgerigars with his wife, who is known as Budgierose the Australian budgerigar artist, for about 12 yrs. 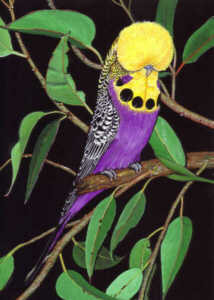 Their aviaries and art studio is located north of the city of Adelaide, South Australia. 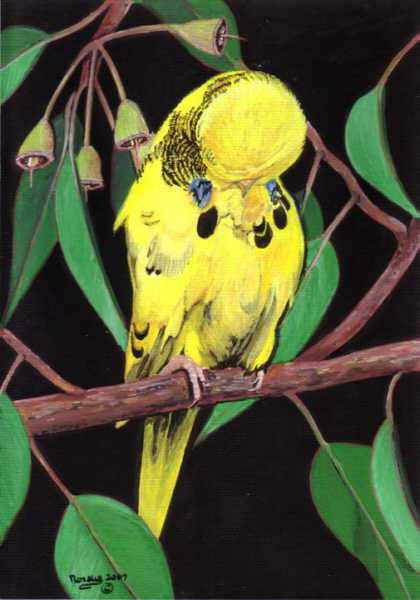 They mostly breed the normal varieties, consisting of Opalines, Greens, Greygreen, Lutinos, Spangles, Yellowface and Cinnamons. Over the years they have had a number of champion birds on the top bench. Their biggest achievement has been winning the Australian Championships Any Other Specialist Variety class with a hen bird in Fremantle, West Australia in 2001. 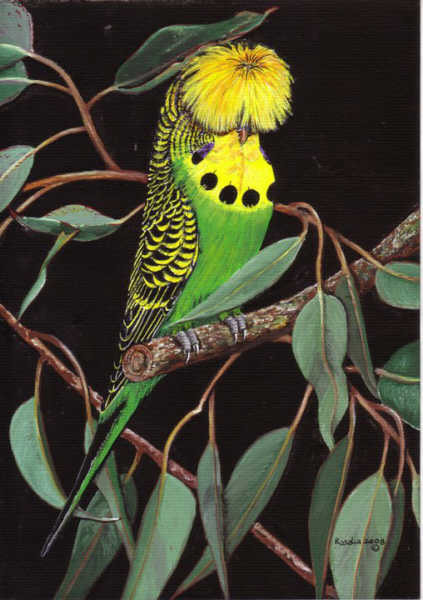 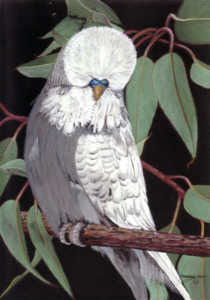 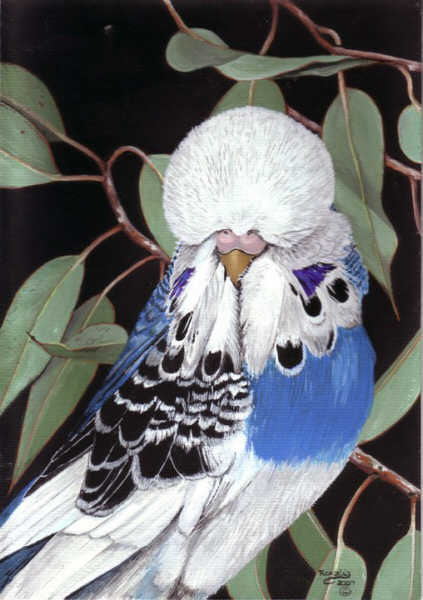 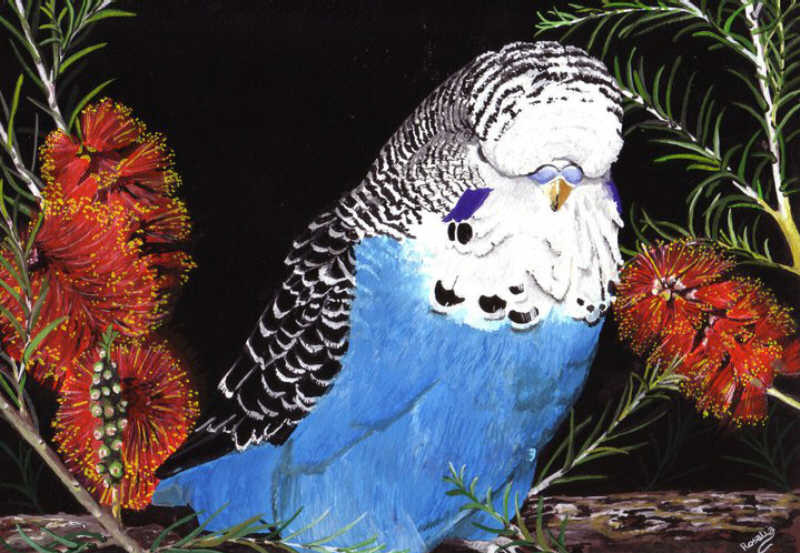 Rose’s paintings of the Australian Exhibition Budgerigars are well known throughout Australia and are now used for trophies etc, by various budgerigar societies around Australia and the world. Awesome paintings Rose and Mike Rafferty thank you very much for sharing with us. Fantastic paintings. Do you have any prints for sale. 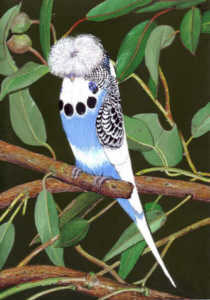 I am interested in the Grey Spangle, the close up of the Cobalt Dominant Pied and the Sky blue Greywing. 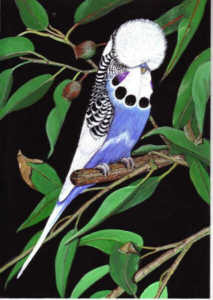 I would love to see the rest of your Budgie paintings.